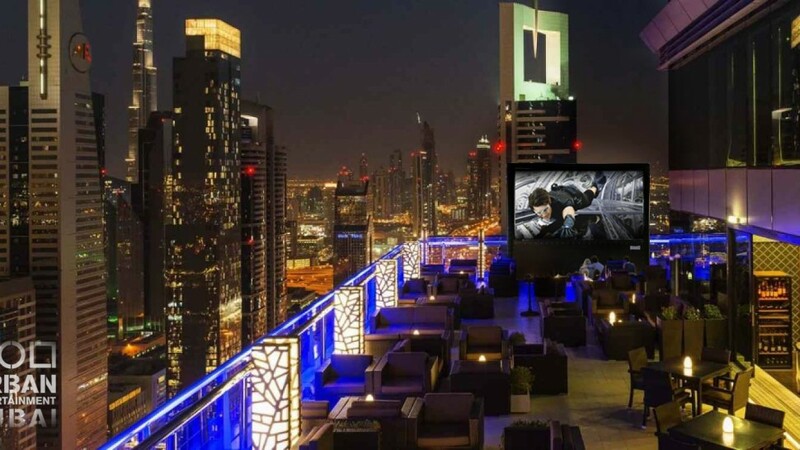 Urban Entertainment have the privilege of launching our first Rooftop Cinema screening event in Dubai at the award winning Level 43 Sky Lounge venue at Four Points by Sheraton. Urban Entertainment have the privilege of launching our first Urban Rooftop Cinema screening event in Dubai at the amazing Level 43 Sky Lounge, Four Points by Sheraton. Providing our 16ft x 9ft AIRSCREEN, Christie HD 12000 ANSI Lumens projector and all other Audio Visual requirements, this will be the very first of many Rooftop Cinema screenings at this amazing venue. The film on the night ( Mission Impossible : Ghost Protocol ) is a perfect match, with spectacular views and a backdrop of the Dubai Skyline, including the Burj Khalifa, the tallest artificial structure in the world, this will be an event to remember. The award winning venue Level 43 Sky Lounge will also be offering its famous food and drinks for all guests attending. Officially opening its doors in September 2014, this chic modern restaurant and lounge crowns the 43 story building on the busy and bustling Sheikh Zayed Road, providing its visitors with a spectacular panoramic 360 degree view of Dubai’s skyline. Viewing the city’s most iconic monuments like Burj Khalifa, Burj Al Arab, Atlantis, Dubai Mall, and the Jumeirah coastline, guests can quickly take in the beauty of Dubai within a moment’s time. A place where beauty and magnificence are commonly used to describe the breathtaking views, Level 43 has more to offer than just a unique outlook of Dubai. Offering lunch, sundowners, and social sharing dining options, guests are able to enjoy great snacks and drinks to accommodate the gorgeous sights. Cocktails, mocktails and tasty tapas are the contents of the menu, along with other tasty treats that will tickle a few taste buds while your mind wanders. The outlet offers both indoor dining seating as well as outdoor lounge seating, perfect for pre-dinner cocktails or luscious sundowners. With cool breezes, frosty drinks at hand, and laidback melodies to sweeten the view along with an upbeat touch of the in house music stylist, Level 43 sets the perfect tone of relaxation and revitalization that is sure to wow any visitor.